Varicose veins, probably not your favorite topic to discuss over lunch with friends, but don't worry, it's more common than you think with 1 out of 4 people suffering in some form or the other. You might think that varicose veins is a present day phenomenon with the big emphasis on image and looks, but actually the opposite holds true. As far as we know the first record of varicose veins dates back to the old Egyptian kingdom around 1550 B.C and the oldest image ever found at the foot of the Acropolis is from 400 B.C. Similarly, treatments have been around for a long time, but none that didn't end in a bloody and painful mess. Fortunately, a lot has changed these days, with ample treatments to attend varicose veins or prevent them from happening in the first place, like with compression socks. 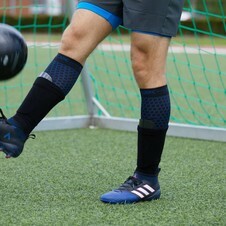 STOX Work Socks, optimize the blood circulation with its graduated compression technique, increasing waste and fluid disposal from the body. In our body we find both arteries and veins. The main difference is that whereas arteries carry oxygen-rich blood from the heart to the rest of the body, veins on the other hand carry oxygen-deprived blood back to the heart. In those veins we find valves that help to press back the blood upwards against the pull of gravity. It just so happens that with varicose veins these valves are unable to close properly, causing the blood to accumulate. This then widens the vein and causes tension. Though varicose veins are not necessarily dangerous by themselves, they can signal a deeper, more serious problem like thrombosis. Usually though, we're mostly concerned about its unflattering appearance. There are many myths going around concerning the topic varicose veins. Just to clarify, varicose veins are not caused from going to the sauna, nor is it caused by crossing one's legs, or by running frequently. In fact, running and exercising regularly can actually help to prevent varicose veins. In some severe cases, the skin around the vein can even become scaly and cause discoloration and extra fluids can start forming around the ankles, also known as edema. So how can we prevent Varicose Veins? There are numerous treatments around to treat varicose veins, but with STOX energy socks you can actually prevent them, giving varicose veins no chance. STOX Work Socks are available in the colors black, blue and white matching perfectly with your daily attire. 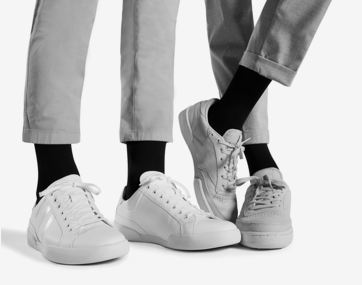 At the same time all socks are made from the same medically designed compression technique that will give you the support you need. 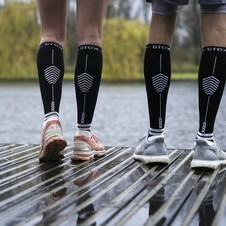 STOX has socks for every occasion: the Sport Socks when you're running, playing golf or tennis, Travel Socks during long flights or the Recovery Socks to recover after a grueling workout.